On one of our outings from La Tranquilita, we had lunch in Amalfi, complete with digestive liqueur, and then drove up, up, up to Ravello by way of a long, winding road. 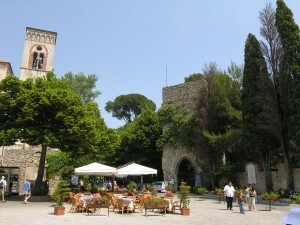 To say that Ravello is incredibly beautiful is but to state the obvious. It had tiny, crooked streets, with various flowers, most of them blue or purple, with some reds and yellows thrown in for variety’s sake, that grew out of the cracks of whitewashed wall, and there were flowers everywhere. The piazza (and there was only one) had its taverna and its assortment of old men sunning themselves while sipping their drinks and talking with one-another, possibly about the tourists who were looking at them. From the high terrace of what had been a Papal retreat there was a view of the wide blue sea, the never-ending sky, and the grey cliffs below not to be matched by any other. 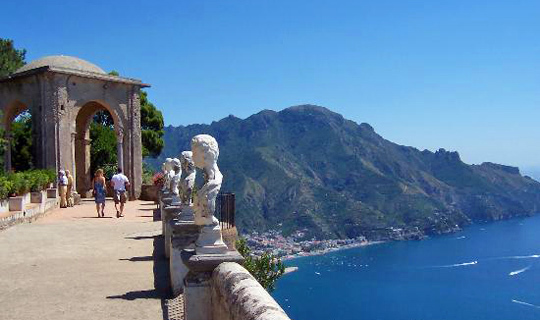 There is a story (that may not be entirely true) that when Satan tried to tempt Jesus with the beauty of an earthly kingdom, he took him to Ravello. Good tourists that Linda and I were, we spent the afternoon there just wandering around, and at dusk, we got into our Fiat and drove back to La Tranquilita. It was quite dark by the time we got back to our hotel, and the door was locked. We rang the doorbell, and the owner opened the door. Although I didn’t speak Italian and he didn’t speak English, the man had developed a liking for me because of the fact that I often banged my head on his low doorways. As he ushered us inside he placed an upright index finger across his lips in the international sign for “hush!” and led us on tiptoes to the grapevined terrace on which earlier in the day we’d had breakfast. The sea shimmered in the light of a huge, full moon. 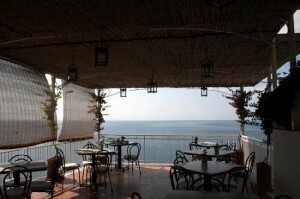 There were a dozen or so people sitting on the terrace, whether locals or tourists I could not tell, listening to a young man singing Italian patter songs to the accompaniment of his own guitar. He was very good, and deserved the applause he received from his audience. While the young man played his guitar and sang, there was a grey-haired, handsome, Italian man quietly sitting in a corner. When the young man finished his songs, there was a demand from the several Italians in the audience that the older man sing. Obviously, they knew him. He seemed reluctant, but after some pleading, he picked up his guitar and began to sing. I once again regretted not knowing Italian, as the lyrics to his songs must have been worth understanding. He sang the most beautiful Neapolitan love songs I’ve ever heard. It was fantastic. The combination of this man’s voice, whose name I didn’t even know, with the huge moon over the sea, and the terrace itself with its grape-leaved trellised ceiling, was one I will never forget. It was again, one of those unplanned musical events which seemed to happen by themselves wherever we went in Italy, and each with its own character.